Help, my succulent is growing weirdly! Oh no, how do I fix etiolation?? Oh no, how do I prevent etiolation? 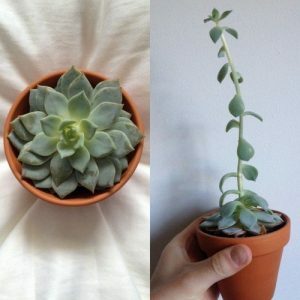 Is your succulent growing strangely tall? Is it becoming thinner or tapering off? Or perhaps the leaves have become larger or more spaced out? 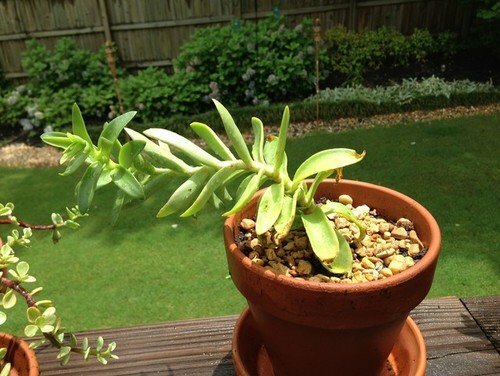 Your succulent is suffering from etiolation, which is commonly referred to as stretching. Etiolation is a natural process that occurs in almost every group of plants, succulents included. It is the plant’s response to a complete or partial lack of sunlight. The plant responds to these unfavorable conditions by rapidly growing outwards to where it believes more light might be. In most cases, this direction is upwards, towards the sun. However, if you keep succulents on a windowsill you might find them stretching towards the window if they are lacking light. The plant invests more energy into growing outwards than it does normally in a desperate bid to find energy. Well, I’ve got some bad news… You can’t fix an etiolated plant. The odd growth it performed is now a permanent feature of that particular plant. 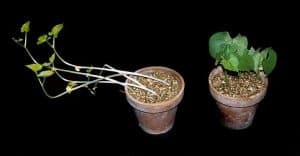 You could perhaps use this mechanism as a tool to create interestingly-shaped plants (try providing light from the direction you wish it to grow for only a couple hours a day, then keep it in darkness for the remainder). But if you want to restore your beautiful succulent to that pristine symmetry that made you fall in love with it – you’re out of luck. However, those of us that grow fat plants have an advantage over those normal gardeners. Namely, propagation. If you have an echeveria, consider trimming off the rosette at the the end and replanting it! 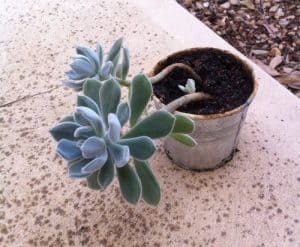 For other succulents, it might be appropriate to pull the healthy leaves from the etiolated stem and propagating those. In most plants, trimming the stem at the beginning of the etiolation will allow it to resume normal growth. It should be noted that etiolation is not an inherently harmful process. In nature, the plant will often find the sunlight it needs and resume normal growth. In the worst case, the plant suffers stability issues from the uneven weight distribution. Many people find etiolation unsightly, however, and so strive to avoid it. You’ve probably guessed the remedy for this problem already – fix the light source! You can achieve this is several ways. 1. Reposition your plant! 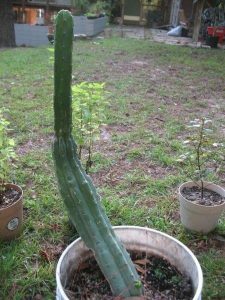 Put it in a spot that receives more direct sunlight (but be careful not to let it get sunburned). It’s difficult to move the sun, but it’s much easier to move your grow lamp to be directly above your plants. Likewise, the cardinal direction your windows face affect the way and duration that light enters. Try different windows, or maybe a window shelf. 2. Use a grow lamp. These lamps made specifically for plant growth shine red and blue light at your plants, which are the optimal wavelengths at which photosynthesis occurs. 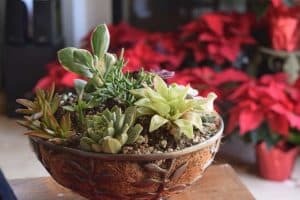 Sublime Succulents wrote a whole article about them – check it out! 3. Grow different plants. Sometimes you can’t meet the light requirements of a plant, and that’s okay. You didn’t really want that plant anyway. 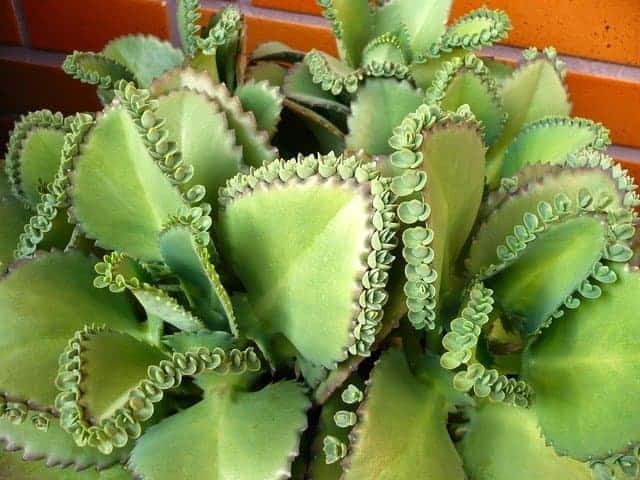 What is the difference between Mother of Thousands and Mother of Millions?